Over a year ago I wrote The Last Dinosaurs, a post stating quite clearly that I don't believe dinosaurs (as in the order dinosauria) have managed to survive in a recognisable form into the modern era. Birds are the closest we are going to get. But there are still a few interesting stories that I've seen since then that should be put out there for consideration. Tales of sauropods and other quadrupedal dinosaurs are two-a-penny in cryptozoology. But theropods, two legged dinosaurs such as Tyrannosaurus Rex, are a little less common and all the more intruiging for it. 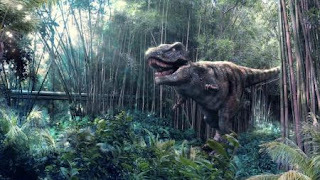 Could there really be giant bipedal dinosaurs stalking our planet still? Although I'd obviously previously heard of the most famous Australian reptilian anamoly; Megalania (I type this sitting in a chair with one of Megalania's relatives Mr Gibbs The Bearded Dragon lying on my chest) I'd never heard of a Burrunjor. It would appear there is another giant beast stalking the outback. Campfire stories substantiating Aboriginal claims are commonplace across the far north. Back in 1978, a Northern Territory busman and explorer, Bryan Clark, related a story to me of his own that had taken place some years before. While mustering cattle in the Urapunji area, he became lost in the remote wilderness of that part of Arnhem Land. It took him three days to find his way out of the region and back to the homestead from where he originally set out.He had not known at the time, but his footprints had been picked up and followed by two Aboriginal trackers and a mounted policeman. On the first night of their search they camped on the outskirts of the Burrunjor scrub, even though the two trackers protested strongly against doing so. The policeman hobbled his horse, cooked their meal, then climbed into his swag and went to sleep.Later that night the two Aborigines shouting intelligibly and grasping for their packs and saddles suddenly woke him up. The policeman also realised at this moment that the ground appeared to be shaking. Hurriedly getting to his feet, he too gathered up his belongings, and shortly afterwards, the three galloped away. As he told Bryan Clark later at the Urapunji homestead, he had also heard a sound, somewhat like a loud puffing or grunting noise, certainly loud enough to be coming from some large animal. When asked if he intended to include this incident in his report, he replied he would not because he feared no one would believe him. The policeman warned Bryan never again to return to that area, because if he got lost there again he’d be “on his own”, as he would not come looking for him! The region’s cave art, thousands of years old, depicts these monstrous animals. Many Aborigines believe these monsters wander back and forth across the Gulf country and Cape York to this day. Back in 1950, cattlemen lost stock to some mysterious beast that left the mutilated, half-eaten remains of cows and bulls in its wake over a wide area, stretching between the border country and Burketown. Searchers on horseback found huge reptilian tracks of some bipedal-walking beast. They followed these three-toed tracks with their cattle dogs through some rough jungle terrain until they entered swampland beyond which was more dense scrub. However, it was at this point that the cattle dogs became uneasy and ran off. The horses were also uneasy and obviously did not want to cross the swamp. While most of the cattlemen decided their animals knew best, two men set off on foot with their carbines. The story goes that they soon came across further tracks in an open area beyond the swamp. While his mate searched about, the other man briefly spotted the dark form of an enormous creature, perhaps 30ft in height, further off in dense timber. The men left the scene in haste. In 1985 a 4-wheel drive vehicle and it s family of travellers, the Askeys, heading for Roper River Mission, happened to take a back road for some sightseeing. Just before they were to pull up and turn around to resume their journey to the mission, they all saw, moving together across an open plain some distance away, two bipedal-walking reptilian creatures a good 20ft tall respectively. “The monsters were a greyish-brown colour and dinosaur-like in appearance. We didn’t wait around”, said the father, Mr Greg Askey. I certainly think there is a lot more "evidence" for this creature than for the slightly more famous story which is to follow, but I still think we must be wary. Australia is certainly massive and whilst it may have over 20 million inhabitants, this is a drop in the ocean considering the size of the continent. However could something large really escape the attention of science for so long? I think it is interesting that the aborigine population have legends that back up the story but aborigine's know no more about the outback than many other Australians nowadays and thus I don't think we should suddenly start to accept all their beliefs and folk tales as fact. On February 16 last I went on a shooting trip, accompanied by my gunbearer. I had only a Winchester for small game, not expecting anything big. At 2 p.m. I had reached the Kasai valley (sic). No game was in sight. As we were going down to the water, the boy suddenly called out "elephants". It appeared that two giant bulls were almost hidden by the jungle. About 50 yards away from them I saw something incredible - a monster, about 16 yards in length, with a lizard's head and tail. I closed my eyes and reopened them. There could be no doubt about it, the animal was still there. My boy cowered in the grass whimpering. It was simply terrifying. The boy had taken French leave, carrying the rifle with him. At first I was careful not to stir, then I thought of my camera. I could hear the crunching of rhino bones in the lizard's mouth. Just as I clicked, it jumped into deep water. Now based on this report, even if it was real which I very much doubt, there is nothing here to suggest this is a Tyrannosaurus. The creature is referred to as a lizard and no remarks are made about it hunting on two legs or in fact even standing up on them. So alas I don't think we have two legged carnivorous dinosaurs roaming about the Congo. With just one report I think we can safely put this one down as a "hoax". So there are two more dinosaur survival stories for you to feast on. Enjoy! Very interesting! I have always been interested in Cryptozoology. Whether there are still dinosaurs around, I can't say because I have not seen one but many many people to have and I don't think all of their claims can be dismissed! I always liked dinosaurs. . .from far away and have always had interest in Cryptozoology as well. You should definitely get in touch with the show, "Monsterquest" on the History channel, since this would be up their alley. Wouldn't it be amazing to see that These people from the show visit these areas! Monster Quest have actually had Bill Gibbons on, and he is one of the foremost dinosaur hunting cryptozoologists (although I'm not endorsing him there!) It would be great to see them somewhere like the Congo or the Outback. As for "many many people" seeing dinosaurs... I don't think that is exactly true. I'd be happy if it was, but it's a very small number overall. I've always been really interested in Cryptozoology. Thanks for writing this blog! I've been really enjoying it! Hi, ur post is really interesting, While reading ur blog I truly like & enjoy it .I just wanna suggest that u should go for blog advertising & marketing there is a website which is offering very unique features at affordable prices there are expert advertising team who will promote ur blog & affiliate ads through all over the networks.. Finally I have bookmarked ur blog & also shared with my friends hope u have a wonderful day & ! !happy blogging! !.